A fun, exhilarating site to visit that offers players a fresh and fun gaming experience that is mobile optimized for ease of play regardless of your location. 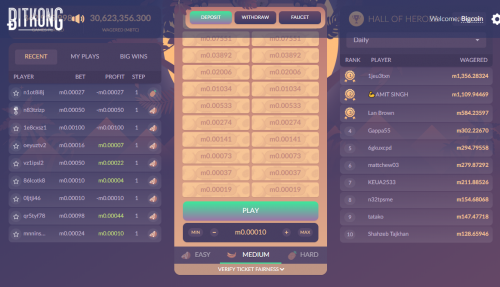 Many players rate Bitkong as their favorite online gaming experience due to its efficient and seamless gameplay, as well as rich rewards and great support. While Bitkong is a Bitcoin only casino you have the option of having a converter display your Bitcoin value as USD, EUR, GBP or CNY. Bitcoin is displayed in Bits or mBTC. Bitkong offers a Provably Fair game that uses a Random Number Generator (RNG) system. The game that is on offer is similar to a Minesweeper type game, the similarity being that if you choose the field that does not have your fruit you will lose your whole bet. The aim of the game is to be able to pick the field (represented by a rectangular cell with a prize label) that has a fruit to be able to move up to the next row. Easy setting – 2 out of the 3 fields have a coconut. There is a 2/3 chance of moving forward. Medium setting – 1 out of the 2 fields in a row has the banana. Hard setting – 1 out of the 3 fields in a row has a pineapple. If you pick the right field, your bet will increase based on the prize indicated on the field and you will be able to move up a row. There is a slight draw back in that the ‘reveal’ takes time to show itself which slows down the game slightly. When it is revealed whether or not the field you picked has the fruit, the game continues flawlessly. The good thing with this game, is that you can take the prize you have earned so far after clearing a row. Even after the first row you are able to take the prize. You don’t need to complete all 10 rows to be able to claim your money. Bitkong has a demo version, so you can try it even if you have no Bitcoins to deposit yet. Although there is a free Bitcoin faucet, which we’ll come onto shortly. Bitkong, hosts an array of Bonuses such as a No Deposit Bonus, as well as free Bitcoin in the form of a Faucet, and an excellently rewarding Affiliate Program. 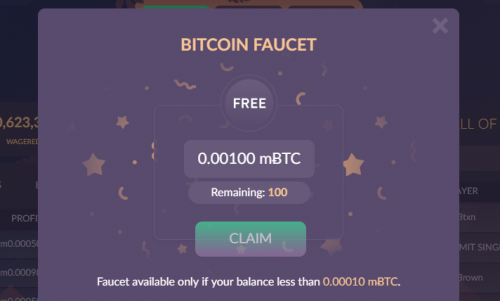 The Bitcoin Faucet – This feature is accessed through the game interface. Every time you lose or every time a game ends, you will receive three options to choose from, including Play Demo, Deposit to Play, or “Get Free Bitcoins”. Click on Get Free Bitcoins to go to the faucet. The faucet provides 10 bits after every 10 minutes. The Affiliate promotion – This is basically a referral program where a player is rewarded with Bitcoins, or rather denominations thereof, for referrals. This affiliate program pays 0.25% of every bet made by the player referred to the site, regardless of whether they win or lose. An affiliate URL is clearly presented on the site. Just click on the Affiliate link or the Invite Friends and Earn Bitcoins button at the bottom part of the site. The site provides almost everything you need to quickly reach out to potential players you can refer to the site. There are buttons for quickly sending links to your contacts on Facebook Messenger, a button for sharing the link on Facebook, as well as a button for quickly tweeting your affiliate link. You can also download banners for your blog or website and copy the simple HTML forum signature code. There are no other rewards at Bitkong such as a VIP or a Return Player Bonus. The first thing to take note of is that you cannot play on this site unless you sign up through a Facebook account. Once you have registered you will find the Deposit and Withdrawal buttons clearly displayed on the interface for your convenience. It is very important to note that Bitkong only takes deposits and pays withdrawals in Bitcoin. The fiat currencies mentioned in this review are only for the gambler’s convenience of being able to convert their bets and winnings into a currency they are familiar with. This helps those still becoming familiar with cryptocurrency to be able to equate their game spend, making it easier to understand where they stand but is for presentation purposes only. To make deposits, you just have to click the Deposit button. You will then be presented with a Bitcoin wallet address so that you can deposit an amount that you feel comfortable with. There’s also a QR code in case you want to make the deposit through your mobile device. The minimum deposit amounts are indicated on the Deposit interface along with their BTC conversions. Withdrawals are equally as simple. You will place your mouse over the button with a Bitcoin icon to show the Withdrawal button. There’s a transaction fee of 200 bits that will be deducted for every withdrawal, which is automatically deducted from the amount being withdrawn. A Two Factor Authentication process is required to be able to finalize a withdrawal. Customer Support can be accessed through email. The email address is support@bitkong.com. There is no live chat or telephone support available. However, BitKong has social media accounts on Twitter and Facebook, as well as a thread on the Bitcointalk.org forum. Although we couldn’t find licensing information or Security measures on the site, BitKong’s lengthy operation and positive user feedback hints towards it being a safe site to use. The login system is linked to the players’ Facebook accounts, making it difficult for random players to access another player’s account. The site is also SSL secure. Bitkong can be considered somewhat anonymous as it does not request player information. Even though the accounts are tied with players’ Facebook accounts, BitKong guarantees that player activity is not revealed on social media or anywhere else. A refreshing, entertaining site that is 100% Provably Fair and will keep you coming back for more. There is only one game, but it offers some fantastic rewards. Once you are over the hurdle of registration you will access the main interface, which is simply designed. BitKong is a great gambling site that could be a good option if you are looking for something that allows you to play quickly. It even offers free Bitcoins you can use for playing. BitKong does not offer any deposit bonuses but does have a free Bitcoin faucet and leaderboard promotions. More details about these promotions can be found in the main body of the review above. 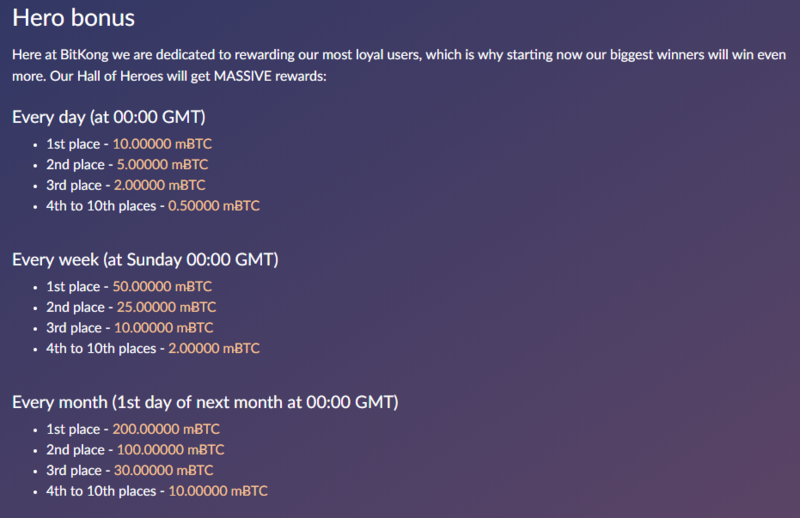 BitKong does not currently offer any Bitcoin bonuses to its players!